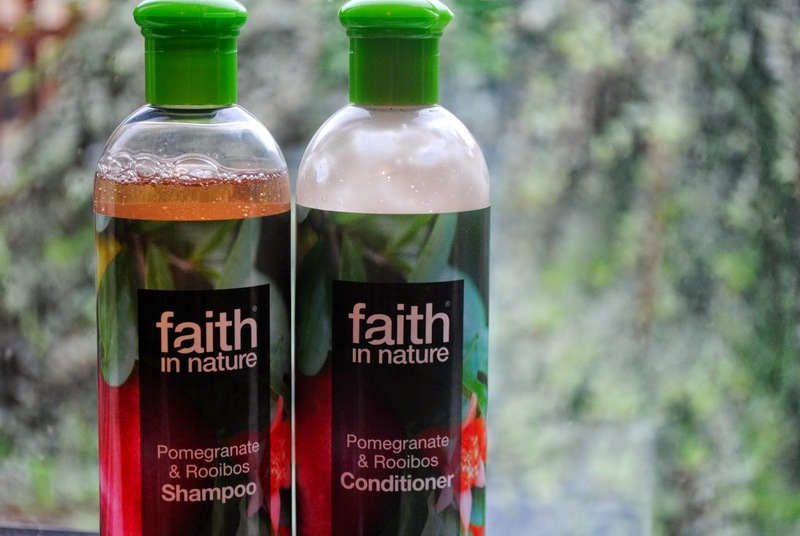 So when Faith In Nature offered me the chance to try some of their products out just as I was coming to the end of my latest Joico tubes it was perfect timing - and saved me from a 30 minute shelf-staring exercise in the John Lewis beauty department. I opted for the Pomegranate & Rooibos Shampoo and Conditioner which both smell gorgeous - naturally fresh and fruity. All Faith In Nature products are completely organic, vegan, and best of all, 100% cruelty-free which is something I'm really trying to be more aware of when shopping now, especially as so many brands who were once cruelty-free have unfortunately started testing on animals in certain countries. Once I've used these I feel as if my hair is what it should naturally be like - shiny, light as a feather, and squeaky clean. I think this is because all of Faith In Nature's products are natural - there's no artificial chemicals that leave any residue or build up in your hair. The shampoo doesn't lather as much as others, as you'd expect from an organic product, and while this takes a few washes to get used to I didn't find this was a problem at all - I've grown to like the more natural cleansing feel it gives. The conditioner was great at smoothing and detangling my hair, which gets knotty easily as it's long and quite fine. I also found the products great to take to the gym with me as the bottles are light and they made my hair feel amazingly clean and fresh after a (not-so) strenuous yoga class or my bi-monthly run (I wish I could say that was an exaggeration and really I run every other day but actually it's probably quite accurate...). I've since spotted Faith In Nature products in my local As Nature Intended store and can never resist having a browse of the range when I pop in to do some food shopping. My hair definitely feels and looks better for using a more natural shampoo and conditioner, and although the bottles are getting emptier and I'm getting that itch to buy something new again, I think I'll definitely be going back to Faith In Nature in between other brands to give my hair a well needed break from those nasty chemicals!